Teens from across Chicago joined survivors of the Parkland high school shooting and local activist groups Monday to speak out against gun violence and call for justice days after a man was shot and killed by a Chicago police officer. The students filled the second floor of City Hall holding signs and mock gravestones with the names of men and women shot and killed by Chicago police, including Laquan McDonald, Quintonio LeGrier, Bettie Jones and Maurice Granton Jr. – a 24-year-old man who was shot and killed last week as he ran from Chicago Police Department officers. Granton was fatally shot in the back Wednesday evening following what the CPD described as an “armed encounter” with officers in the 300 block of east 47th Street on the South Side. Officers were there conducting a narcotics investigation, according to a preliminary CPD statement, when Granton fled on foot. The officers told Granton to stop, at which point they say he produced a weapon. One officer then fired three shots, killing Granton. Police recovered a firearm at the scene, but Granton’s family contends it didn’t belong to him and says he was unarmed. A day after the shooting Chicago police released security video that apparently shows Granton holding a semi-automatic handgun before the shooting that officers later recovered. The Civilian Office of Police Accountability released a statement that same day saying it had reviewed footage from the responding officers’ body-worn cameras and interviewed several witnesses as part of its ongoing investigation. CPD spokesman Anthony Guglielmi has said the body camera footage will eventually be released, though it’s COPA that determines when exactly that will occur. The officer involved in the shooting has been placed on routine administrative duties for 30 days and the department says it’s conducting a comprehensive use-of-force investigation. 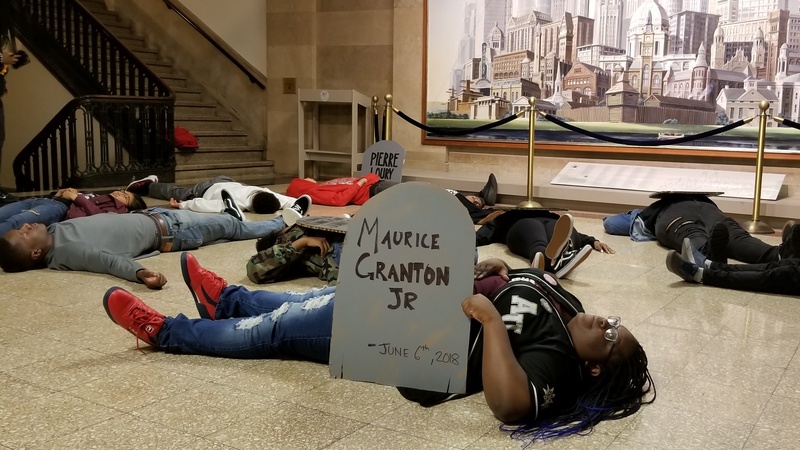 The teens also held a three-minute “die-in” Monday in remembrance of Granton and others killed by the Chicago Police Department, and spoke out against a $95 million police and fire training academy that’s been proposed for the city’s West Side. That building would reportedly include a new shooting range and swimming pool. “Black students get suspended at a rate three times higher than white students,” said Alex Wind, a Marjory Stoneman Douglas High School student who has become a vocal anti-gun activist after a classmate killed 17 people inside his school in February. Local teens say Mayor Rahm Emanuel should instead put that money toward bolstering mental health facilities and Chicago schools, especially after the city decided to close four Englewood high schools.